Just been for our first trip to the movies with poor poor Nina. 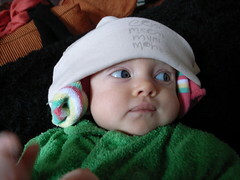 Bianca was worried about her hearing so made her wear socks on her ears!! She slept through Star Trek except for a good feed somewhere in the middle.